Our little resort offers you self-catering accommodation without the crowds. The 6 self catering chalets are designed to sleep between 2 and 10 guests per chalet. All units include bedding but we ask guest to please bring their own bath and beach towels. Chalet kitchenettes are fully equipped with mini-stoves, fridges, microwaves, kettles, toasters and electric frying pans. All chalets have one bathroom with either baths or showers. 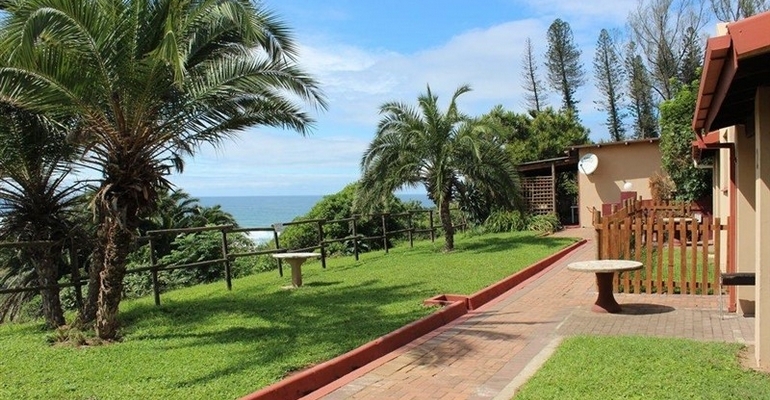 They have sheltered patios with portable braais and garden furniture with views over the Mtwalume River and sea. The reception office has a tuck shop, laundry facilities and a games room with a pool table, table tennis and darts as well as DStv. Outside there is a swimming pool with a Lapa and poolside braai facilities with 2 swings for the children to enjoy. Access control at the entrance gates ensures your safety. We are a 700-metre stroll to the beach with a large tidal pool to be enjoyed by kids and adults alike. Alternatively, guests can swim in the warm blue waters of the Indian Ocean.